Bryan Vera, Julio Cesar Chavez Jr. This time there was no controversy, no booing by the crowd at the decision, no looks of bewilderment from the media – except perhaps over one of the scorecards, which was closer than it should have been. For the second time in five months, Julio Cesar Chavez Jr scored a unanimous decision win over Bryan Vera, but whereas the previous victory was shrouded in dispute and discord, this one was emphatic. At times, Saturday’s main event in San Antonio morphed from professional boxing to Rock ‘Em Sock ‘Em Robots, or a fight scene from a Rocky movie. Scribbling notes about the action in the ring almost became a case of writing “Chavez lands a huge right hand” and “Vera comes back with a right hand of his own,” over and over. Cut and paste. For twelve rounds, Chavez (48-1-1, 32 KOs) and Vera threw everything they had at each other. The difference, ultimately, was that Chavez landed harder, he landed at a higher rate – the connect percentage on his power punches was a ridiculous 62 percent – and he landed with greater variety. He was, at the end of the day, simply better. He needed to be, because Vera (23-8, 14 KOs) showed what he had shown in the previous contest: that he is possessed of relentless energy and a determination to keep coming forward no matter what kind of punishment is being flung in his direction. In the first fight, Chavez had been too slow, too still; even though on that occasion, too, his punches were the more authoritative, he allowed Vera to outwork him with a blistering fusillade of blows of his own. This time, the Mexican boxed far more intelligently and with greater activity from the beginning, stepping forward with his jab and throwing thudding left hooks that Vera seemed powerless to avoid. Chavez mixed up his punches, throwing to Vera’s body and causing him to drop his guard, and then switching upstairs, and following up his hooks with hellacious right hands that repeatedly snapped Vera’s head around and sent the spray flying. Round after round, Vera would begin brightly enough, but each time Chavez would grind him down with his heavy-fisted assault until, at the end of each three-minute spell, Vera would take a deep breath and head back to the corner looking increasingly ragged. But then after a minute of recovery, he would come back out again and start firing – his uppercut proving especially effective – until Chavez would resume his assault anew. Throughout it all, the crowd lustily roared its approval, never more so than during an extraordinary eleventh round in which Chavez, showing his first signs of tiring, suddenly landed a left/right combination that looked to have Vera almost out on his feet. But the next blow apparently woke him up, as the Texan simply smiled again and threw more combinations of his own. The twelfth saw Chavez running out the clock, doing the Ali shuffle and staying out of trouble – a necessary consequence, he said afterward, of having hurt his right hand in the previous frame. When that twelfth round was completed, the scores were unanimous – 114-113, 117-110, and 117-110 again – in the Mexican’s favor. But there were no real complaints from the loser, merely an acknowledgement that, as much as his face-first fighting style is exciting, it may not be in his best interests. For Chavez, who had been heavily criticized for failing to come close to making weight for the first fight, the take-home lesson was equally simple. There has, over the last several weeks and months, been much touting of Vasyl Lomachenko as the future of boxing, and he may yet prove to be; but on Saturday night in San Antonio, the much-decorated amateur found that experience in the professional ranks is not something to be taken lightly, as he dropped a split decision to Orlando Salido in the co-main event on World Championship Boxing. Of course, Salido (41-12-2, 28 KOs) is not new to the role of spoiler: his two stoppage victories over Juan Manuel Lopez in 2011 and 2012 effectively ended the Puerto Rican’s career as a top-flight fighter. And there were plenty who wondered whether, no matter how skilled he might be, Lomachenko (1-1, 1 KO) was biting off more than he could chew by taking on such an experienced champion in just his second professional fight. The first round gave little indication either way, as the two men looked at each other, Salido circling away as Lomachenko feinted and stalked; but over the next several frames, the Mexican veteran began to give his young challenger a lesson in the realities of professional prizefighting, as he walked him down and worked him hard with looping punches to the ribcage and kidneys – and, on more than a few occasions, parts of the anatomy where legal blows are not supposed to land, but for which he went repeatedly unpunished by referee Laurence Cole. Lomachenko began to find his groove in the fifth, firing off two-and-three-punch combinations and pivoting away as Salido came forward, but those punches had little effect on an opponent who failed to make weight and on fight night unofficially weighed 147 pounds - 11 more than Lomachenko. Yet every time Lomachenko seemed to be building a head of steam, Salido would come back, swarming him, throwing punch after punch, looking to land everywhere he could. After ten, it began to seem that the Ukrainian challenger had let his chance slip away, but he came out for the eleventh with a new sense of purpose, rattling Salido with combinations and then, finally, in the twelfth, hurting him badly with a right hand to the head and one to the body. With more than a minute remaining, Salido was in desperate trouble, but he clung to Lomachenko for dear life, forcing the two-time Olympic gold medalist to rip his hands free and resume his assault. Salido survived, but only just. Lomachenko’s charge was too little, too late, as Salido won a split decision by scores of 113-115, 115-113 and 116-112. Lomachenko was philosophical in defeat. “I did my best. It didn’t work out. I’ve got to go home and review the tape,” he said. What type of fight can fans expect the second time around for Chavez-Vera? Jim Lampley: The style of the fight can't change: Vera trying to press the action and use greater energy and activity to outwork Chavez for a decision victory, while Chavez takes his time and selects counterpunching opportunities to land big shots, hoping to wear down Vera and set him up for a knockout. It should be lively and physical. If Chavez appears to have been responsible in his approach to making weight and preparing for the bout, the San Antonio crowd will support him. If not, they won't. Max Kellerman: A fan-friendly fight. Whether or not Chavez has properly rededicated himself, he has an essentially offensive style. And Vera, feeling he was robbed the first time, can be expected to be highly motivated and ready to give the best account of himself possible. Andre Ward: I think we can expect the same Bryan Vera we saw in the first fight. I believe that the Vera we saw the first fight, I think that's probably the best Vera we are going to see. We are going to see a much more motivated, better conditioned and more focused Julio Cesar Chavez Jr. I think that's going to erase all the doubts from the first fight. I can see him stopping Vera in the mid to late rounds in this fight. How well does amateur pedigree translate to professional success and what are your expectations for Lomachenko as a pro fighter? Jim Lampley: Amateur pedigree is the absolute surest predictor of professional success. Muhammad Ali, Ray Leonard, Pernell Whitaker, Floyd Mayweather, Evander Holyfield, Wladimir Klitschko, Gennady Golovkin, Guillermo Rigondeaux were all Olympic medalists, just a partial list. Lomachenko is arguably the most successful amateur fighter of all time. He will have a successful and significant pro career, win or lose vs Orlando Salido. Max Kellerman: Amateur pedigree among fighters who come from nations with significant amateur programs is the single most positively correlated factor in predicting professional success. Lomachenko has a chance to one day, in the not too distant future, be in the pound for pound conversation. Andre Ward: A strong amateur background, especially an amateur career like Lomachenko's, a two-time gold medalist, can hurt or help you. It can hurt you because you're locked in to an amateur system for so long and the pro game is totally different. It can help you if you are able to break the amateur style fast enough. That type of amateur pedigree can put you on the fast track in the pro game and with fewer fights than a normal fighter. Obviously Lomachenko has only one fight and is fighting for a title against Orlando Salido, who is a veteran and a crafty fighter. That shows the kind of confidence that Lomachenko and his handlers have. It will be interesting to see how this plays out because I don't think anything like this has been done before. But the fallout from that debacle provided him with plenty of motivation to do better this time – not in the form of the opprobrium directed his way by fans and media, but in a $250,000 portion that he would be obliged to forfeit if he missed weight again (which would make Mr. and Mrs. Vera’s baby boy a much richer man). One of the boxers on Saturday’s HBO World Championship Boxing telecast did miss weight, however: Orlando Salido, who forfeited his featherweight title when he tipped the scales at 128.25 lbs., two and a quarter pounds heavy. His challenger, Vasyl Lomachenko, was fully three pounds lighter. As a result, Lomachenko – who pocketed an extra $15,000 from the comparatively corpulent Salido – remains on course to make history and become a world champion in only his second professional fight; but even if he wins, Salido will not exit the ring with the belt wrapped around his waist. It was supposed to be so easy for Julio Cesar Chavez Jr. last September: Return from a 13-month layoff and his only career loss to Sergio Martinez with an impressive showing against Bryan Vera, who also happened to be the number-one contender in one of the sanctioning bodies. A victory would put Chavez in line for an immediate title shot and, at least for the time being, all would be well. The troubles began when Chavez suffered a cut on his right eyelid during sparring, which pushed the fight back three weeks. Despite the extra training time Chavez still had major problems making the contracted 162-pound weight limit. Through negotiations the standard was raised to 168 but just days before the fight Julio Cesar Chavez Sr. declared the limit had been raised to 173. That prompted a scramble of epic proportions but after deals were struck Chavez scaled 171 1/4 to Vera's 172 1/2 and the fight went forward. Once the bell sounded, Chavez's problems multiplied as Vera's hustle appeared to be enough to secure the upset. But Chavez was saved by the judges, who saw him as a unanimous decision winner. The subsequent uproar prompted this rematch at the Alamodome, which is friendly territory for both men. Will Vera summon another inspired performance or will Chavez "make things right" and move forward? The First Act: Statistically Vera was by far the dominant fighter. He averaged more than twice as many punches per round (73.4 vs. 32.8) and out-landed Chavez in eight out of the 10 rounds en route to connect advantages of 176-125 overall, 67-27 jabs and 109-98 power. Here's one further illustration of their activity gap: Chavez's highest output in the fight -- 43 in round three -- matched Vera's lowest in round one. 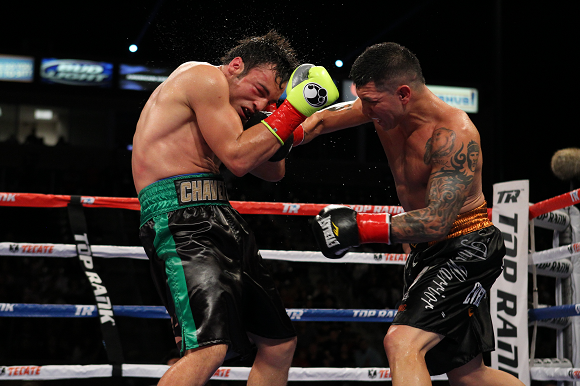 Chavez's saving grace -- besides the judges and his star status -- was his superior accuracy. The gaps were large (38%-24% overall, 19%-17% jabs, 53%-32% power) and Chavez found Vera an easy target for his hooks, crosses and uppercuts. In the round-by-round breakdowns Chavez landed 50% or more of his power shots eight times and soared past 60% three times, peaking at 67% in round six. Vera's volume attack placed prolific numbers above precision, for only once did Vera land more than 40% of his power shots (48% in round two) and in five rounds he was mired in the 20s. This dramatic gulf in effectiveness may partially explain why Chavez won so many of the perceived close rounds. Like Father, Like Son: One of the few knocks against Chavez's father was his propensity to start slowly and that malady has crept into the son's game. Chavez never got out of the gate against Vera as he remained in the 20s and 30s in nine of the 10 rounds and he was stuck in the mud for the first 10 rounds against Martinez (27.9 per round during that stretch). The first three rounds against Andy Lee saw Chavez average just 20 punches per round before the engine finally got running. But when Chavez is working at full steam, he can be a monstrous offensive force. In rounds four through seven against Lee he out-landed the Irishman 96-79 overall and 95-65 power, landing 50% of his overall punches and 58% of his power shots. In the final two rounds against Martinez, Chavez landed 51% of his total punches and 58% of his power shots, including 61% in the final round. Those are numbers that usually produce knockouts and in the Lee fight it did just that. The Martinez surge was a case of a combination of too little-too late and what-might-have-been. The Blue Collar Worker: The cornerstone of Vera's revival -- many believe the Chavez fight should have been Vera's fifth straight win -- has been extreme volume. Against Chavez he averaged 73.4 punches per round, and that was his lowest figure in his last four fights. Against Sergio Mora (the second time around), Serhiy Dzinziruk (KO 10) and Donatas Bondas (KO 7), Vera's average per-round outputs were 105.4, 88.7 and 88.3 -- way above the 54.2 super middleweight average. Like most volume punchers, Vera's accuracy suffered because in his last four fights he landed a combined 23% overall, 15% jabs and 31% power, below the division norms of 31%, 22% and 38% respectively. One unusual aspect of Vera's attack is its balance. Most volume punchers throw many power shots than jabs but in Vera's case he averaged a combined 43.7 jabs and 46.2 power punches among his 89.8 punches per round -- a 51-49 tilt in favor of power shots. Despite his extreme aggression against Chavez, Vera actually threw more jabs (391) than power shots (343). This diverse attack makes Vera unpredictable and that may well be an asset that will serve Vera well in this rematch. Prediction: Vera fought one of the best fights of his career against Chavez and to win he'll have to do it again. As a native Texan, he'll have plenty of support. On the other hand, Chavez is capable of fighting much better and the guess here is that he will. He knows that another sub-par effort, much less a loss, against someone whose come-forward style is seemingly tailor-made for him, will be fatal. Thus, he'll fight like a man with his back against the wall and win a solid decision. Bryan Vera, CompuBox, Julio Cesar Chavez Jr.